I have a rule that whenever a student recommends a book to me, it jumps to the top of my To Be Read pile. When the student hands me the physical copy, I read it in one day so that I can discuss it with her. Or maybe that wasn't the only reason I read it in one day. Ransom Riggs' Hollow City is addictive and hard to put down. 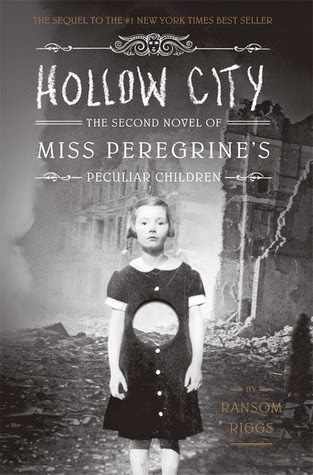 I remember liking the first book, Miss Peregrine's Home for Peculiar Children for its creepy ambiance and uniqueness. Still, the characters were rusty in my memory. I did have a vague recollection of Jacob, the narrator, being whiny, but I didn't find him that way in this book. The beginning of the novel features portraits of the characters, which helped me keep them and their peculiarities sorted. It's rare to enjoy the second book in the series more than the first, but I think I prefer this book. Jacob has accepted that he is a Peculiar, so we don't have to deal with any angst, we just get to follow the group on adventures throughout time and space. The book is fast-paced and full of surprises, particularly the end. When my student handed it to me, she said, "There's going to be a third one." Hooray for that!